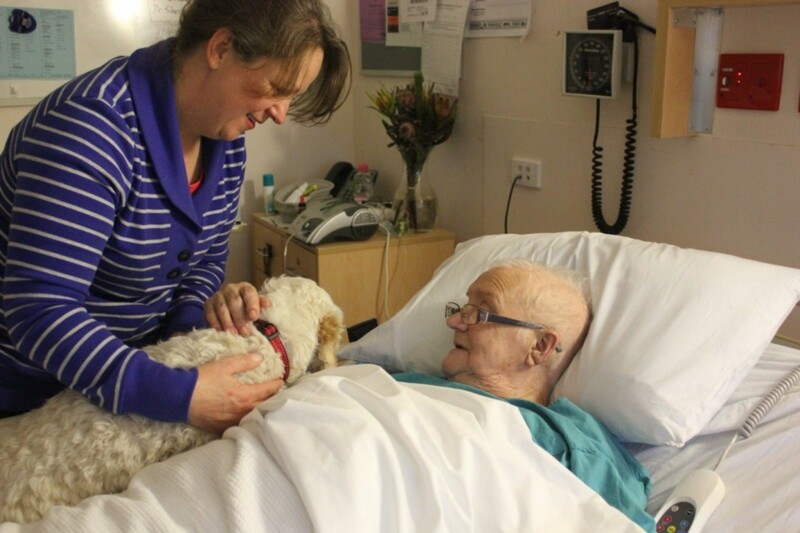 In our Adopted and Adored letterbox today, we have a moving correspondence from Jacqui, who with her beloved therapy dog Archie, has brought a smile to the faces of and joy to hearts of patients in palliative care. When Jacqui was looking for another therapy dog to join Archie, she felt strongly about adopting from a shelter. She was surprised, however, when some advised against it, saying a shelter dog could never have the temperament for such an important task. But Jacqui went with her heart and adopted one-year-old Spoodle mix, Ruby from our North Melbourne Shelter. And, as it transpired, her instincts were right. Please take the time to read Jacqui’s truly touching story. It’s hard to know exactly how to start this story, so… I’ll just begin. When I first met Ruby, I thought she would be perfect as a small sized animal assistant. But I was nervous. People had told me I would be best to go to a breeder, so I’d know exactly what I was getting. But I knew in my heart, it was possible to train and teach a dog who needed a second chance at life. I took Archie with me to meet Ruby at The Lost Dogs’ Home. There was no way I’d precede with the adoption if the two dogs didn’t like each other. All dogs have different personalities, a bit like people, and can clash or rub each other up the wrong way. Staff at The Lost Dogs’ Home were fantastic Archie and I were taken into a special greeting pen where we met Ruby for the first-time. It was unbelievable, we were friends at first sight – wagging tails and cuddles all round! Ruby was quite excitable and a little anxious after being abandoned, but her very friendly nature shone through and I could see she had real potential to be an animal assistant therapist with consistent care and training. Archie liked Ruby, Ruby adored him and I was smitten. On the way home we stopped by to see my husband who was sitting with his father in palliative care. He was keen, as was Ken my father in law, to meet Ruby as they had seen her photo on the web site and like me, already fallen in love with her. Archie lead the way — he knew what to do and how to behave in a hospital — and Ruby followed him like a little shadow. And the connection was instant. Ken had a really special time bonding with the dogs. He rubbed his face in Ruby’s curls, smiled and laughed— it was such a striking burst of happiness and relief from the discomfort of terminal illness. As we were leaving for home, a lady ran down the hallway and stopped us. She asked if her sister Annie could see the dogs too. I couldn’t say no. We took Archie and Ruby into Annie’s room for a visit. Annie took to Archie straight away and they shared some quiet time patting and talking together. I told Annie about Ruby and her adoption, Annie was delighted. As it turns out, Annie had worked at an animal shelter for over 10 years and it was so special for her to meet Ruby. I then held Ruby closely and lifted her up for Annie to see. Ruby stopped, looked at Annie, then slowly and gently snuggled into the crook of Annie’s neck. Ruby sensed Annie’s need and settled quietly by her side. Annie enjoyed running her fingers through Ruby’s soft curls and smiled — an expression of deep peace came over her face. I stood back in disbelief – Ruby hadn’t even made it home yet! I could only imagine what she was capable of with the right care, training and love. All she needed was a second chance. After a while we said good bye to Annie and were once again on our way out the hallway. But before we could reach the door, a second person stopped us and asked for a visit with Ruby and Archie. 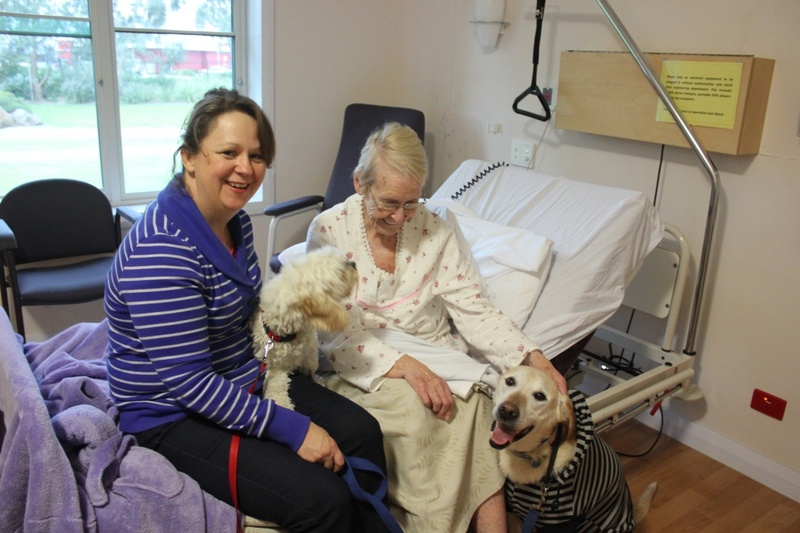 Trish, another patient, was also a big dog lover and was thrilled to see Ruby and Archie. She loved hearing about Ruby’s adoption story and also couldn’t stop smiling as she patted Ruby. 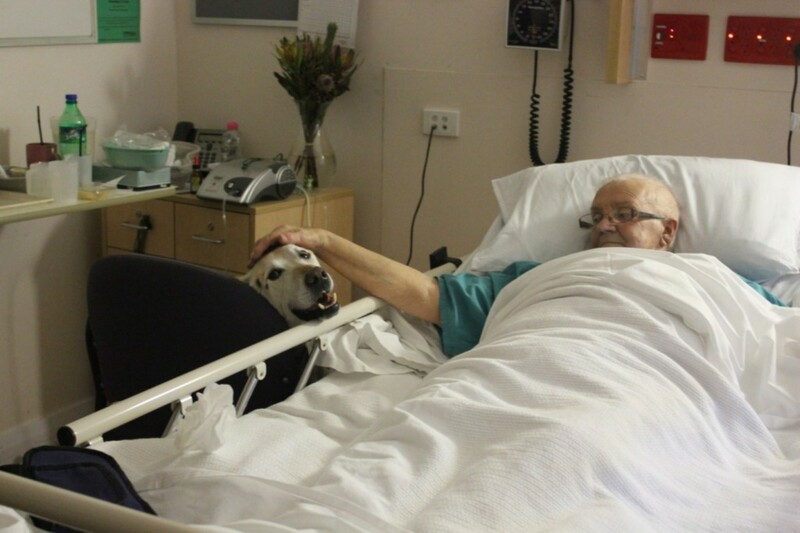 Trish invited Archie up onto her bed for a big dog cuddle and was delighted when he happily obliged. 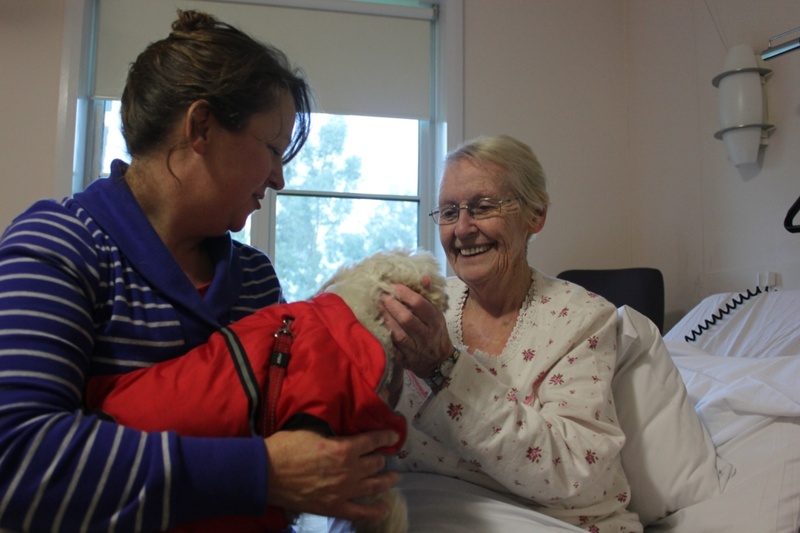 Everyone had tears of joy, enjoying the ray of happiness the dogs shared with those in palliative care. I had no doubt Ruby was the right dog to join the team with a special job ahead. Ruby and I now attend training classes twice a week. She is making good progress learning manners and new skills. Ruby and Archie play for hours together and are best friends. I am so pleased we adopted a dog from The Lost Dogs’ Home. I can’t thank them enough for what they give to our community. 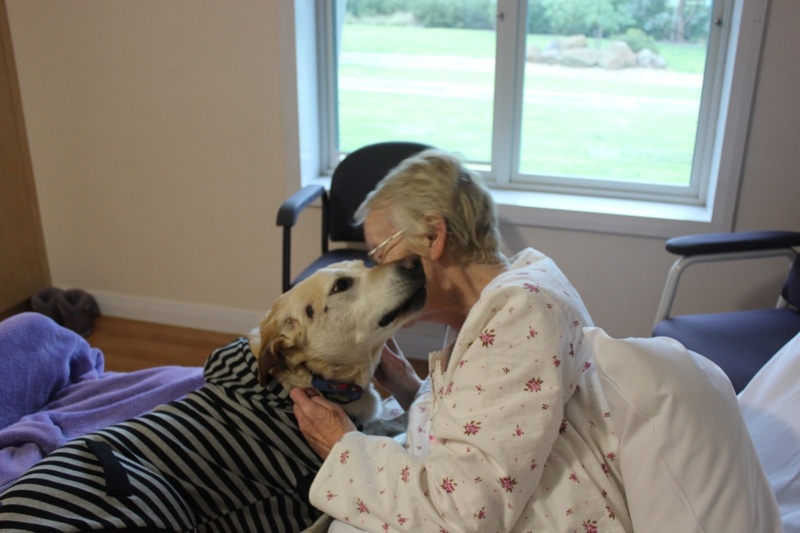 It’s not just what The Lost Dogs’ Home do for dogs, but it is what they do for people too. Gushing new dog owner, proud handler of Archie and Ruby. P.S. Thank you Ken, Annie and Trish. Much loved and resting in peace.